What’s in a name? Here you can only take out, this is no restaurant, but you can order food for home delivery via uber eats Antwerpen! So getting out of your seat is no longer necessary! While his Thai wife prepares the dishes, Karl likes to have a talk. A talk about food, the weather, his lovely clients or the Thai community in Belgium, which he is the proud chairman of. I once asked Karl which dish was his favourite and ever since I know we have that in common, I cannot resist ordering ‘Phad Krapouw’, a spicy wok with chili, garlic and Thai basil. I tend to feel a little guilty for ordering the same dish over and over again, but I switch between veggie, tofu, chicken, pork, beef, duck, scampi or fish. Same bowl, different taste. 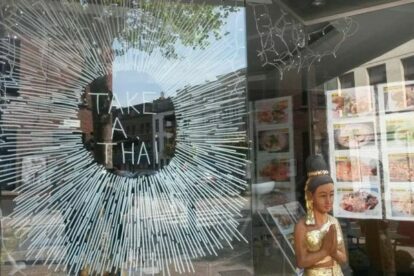 Every day there are three suggestions for lunch, if you want to know them in advance, you just have to like Take A Thai on Facebook. The bakery next door also benefits as the Buddha needs its daily offers: sweets, cake and flowers. Karl’s karma is A-OK. This is probably the best takeout you can find in Antwerp!